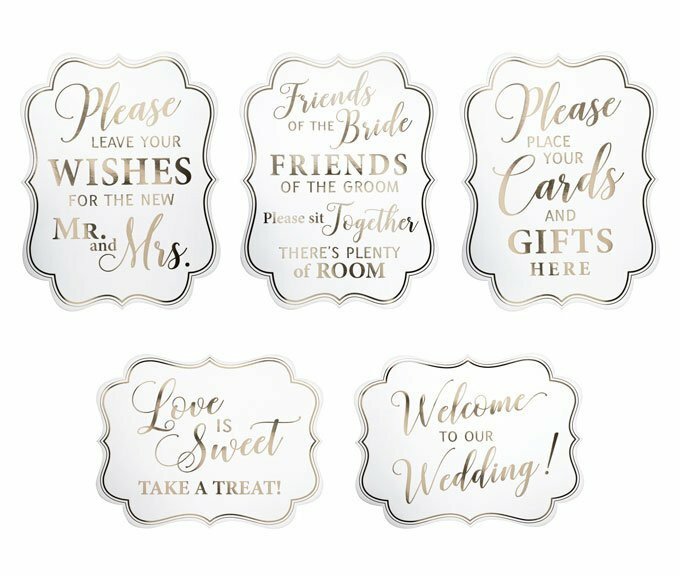 This white and gold wedding sign set covers every noteworthy section of the event: the gift and card table, ceremony or reception seating areas, the bar, dessert table, and guest book area. Signs included: Please Place Cards & Gifts Here, Friends of the Bride Friends of the Groom Please Sit Together There's Plenty of Room, Help Yourself to Drinks, Love is Sweet Take a Treat, Please Leave Your Wishes for the New Mr. and Mrs. The signs are made of heavy cardstock, complete with easels on the backs for easy display.